Elle a regroupé une nouvelle fois les façades maritimes Manche-mer du Nord et Atlantique. World Ocean Day : creation of the marine park "bassin d'Arcachon"
Ségolène Royal était sur le bassin d'Arcachon ce dimanche 8 juin. La ministre de l'Écologie a choisi la Journée mondiale des océans pour inaugurer le Parc naturel marin du bassin d'Arcachon. 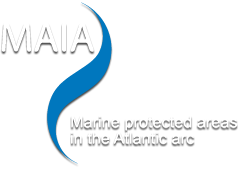 - The MAIA database will be used by the OSPAR convention to collect and disseminate MPA data. The official decision has been taken the 10th of May by OSPAR Heads of Delagations. - What's up in 2013 for MAIA? These publications may interest you, have a look ! The ATEN (French struture for protected areas managers knwoledge tranfert and capacity building) publish Guidlines regarding leisure fishing management in MPAs. On 01/02/2013The European Commission's Environment DG recently released a paper stressing the links between the Marine Strategy Framework Directive (MSFD) and the Habitats and Birds Directives (HBD). - Highlights of special studies, with a focus on MPA: a tool for the ecosystem approach to fisheries. FAO "Fisheries Management: MPAs and ficsheries"
FAO Technical Guidelines for Responsible Fisheries. "Guidelines for Protected Areas Legislation"
Je viens de consulter cette page, http://www.maia-network.org/homepage/news, je te la conseille.